The first American golf club, the South Carolina Golf Club, was formed in 1786 and played on the Harleton Green. Local South Carolina low country resident Barbara Shipman was commissioned to paint the scene [in the style of the period]. 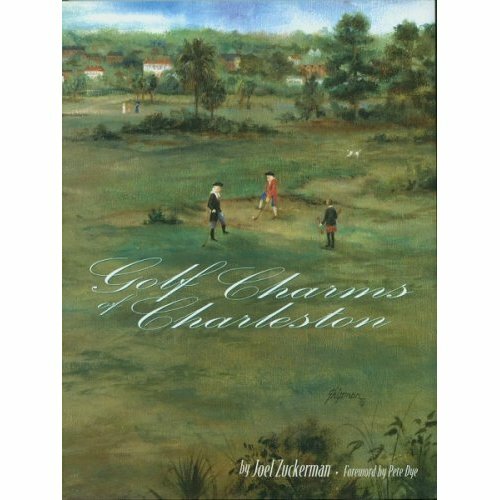 This can be seen on flyleaf cover of the book Golf Charms of Charleston by Joel Zuckerman. A full set: only 8 clubs!? This is a typical looking of a full set of golf clubs from as early as in the 1700s and on through the 1800s. 5 or 8, or so, of these would be loosely carried in the arm or by a caddie. 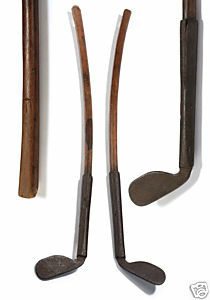 This particular set is dated to the 1840s, but the “long-nose” clubs and a couple irons are the typical make for a long time in the history and play of golf. 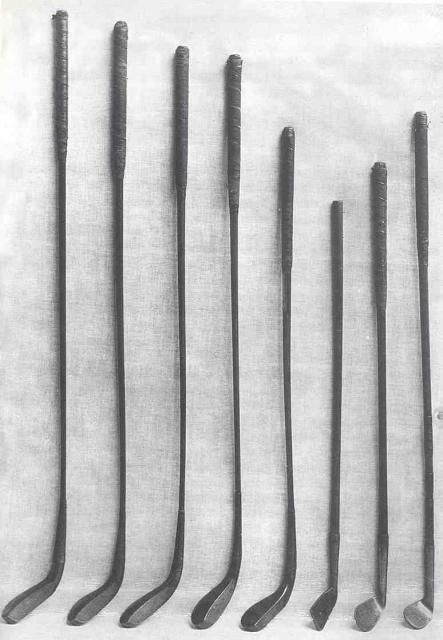 The “technology” for the craftsmenship of these early clubs was developed from archery equipment making and blacksmithing. 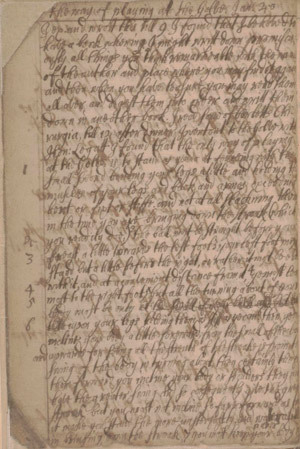 It is interesting to note that these craftsmen would have been making a lot of equipments for military use, and thus the earliest documentation of golfing [in Edinburgh, Scotland] was the forbidding of golf play and football play on the archery military practice range. 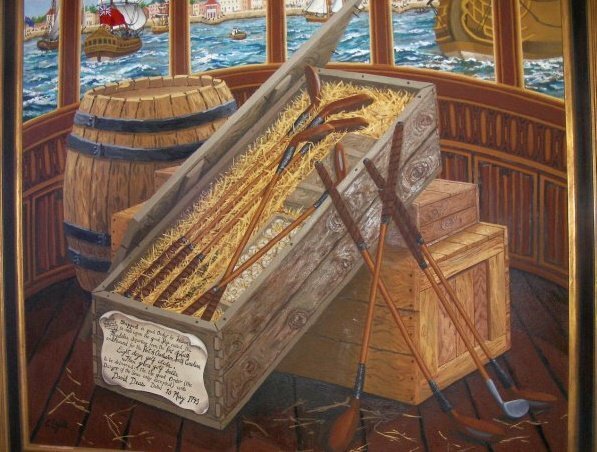 The first set of clubs shipped over to the Americas in 1743 that arrived in Charleston, SC, would have looked very similar. Charleston had an obvious plot of land in immediate access to the people of the city, the Harleston Green a parkland in common use by the public for riding and gaming. Charleston was an extremely important shipping port due to a very rich agriculture (rice and tea), unfortunately as well as the horrible slave trade. Scots were a significant population in the city because of the merchant shipping. As with many rather unique points in history, there was an individual(s) that had the idea and went with it. David Deas received the shipment of golf clubs and balls, but the interesting thing about the shipment is its quantity. 96 clubs and 432 balls are a major amount. Today, with players having a 14 club bag, this would outfit almost 7 full limit bags, but at that time when the typical players carried 5-8 clubs, this amount of clubs would be good for 12-19 people! So whether Mr. Deas was alone in his project and was merely an experienting enthusiast with lots of money to blow on expensive custom handiwork or merely the shipping agent (and possibly not even involved in the gaming), the point is that the amount shows that it is highly probable a dozen players were ready and waiting that shipment. Regarding the involvement of David Deas, a Scottish shipping merchant that had moved to Charleston, he was from Leith, Edinburgh, Scotland, where in 1744 the first golf club was formed (the “Gentlemen Golfers of Leith,” who developed the first recorded rules of the game at that same time for their Annual Challenge for the Edinburgh Silver Club) and a five hole course existed. All this prior to the club and course at St. Andrews (1754). Of course, it is documented that golf, or “golfe”/”gauf”/”gawf,” was a part of Leith and the area as early as the mid 15th century. So Mr. Deas was from the historical homeland of golf. A major fire hit the city of Charleston in 1740. What bearing might this have had on the activity of the city for producing an environment of leisure or need for some folly and sport? A new warehouse district due to a growing shipping business in 1740 (this is now known as Rainbow Row). The population reached a significant 7,000 in 1742. Charleston, SC, the city, the peninsula, the people, and the timing all lined up in 1743 for some group of men of the great city to carry a few mashies and featheries out to Harleston Green for golf.